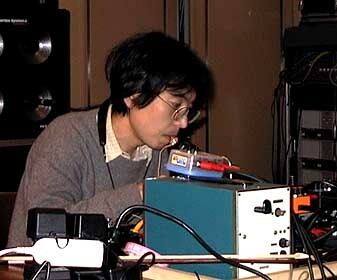 INADA Makoto. 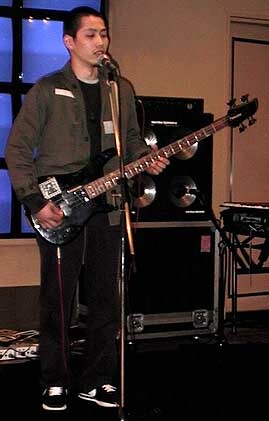 This bass was hooked up to an amp and with occasional distortion added it sounded like a heavy electric guitar. 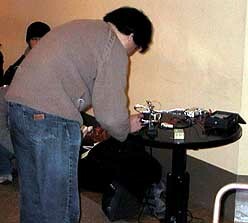 Also present was some electronics producing ambient noisy effects. I really enjoyed these sounds. 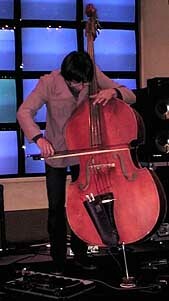 FUKUI Tsunehito told a story/ song in Japanese, plucked his bass. KAWABATA Minoru. 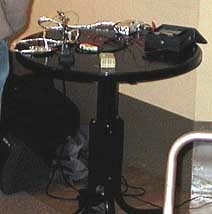 Sounds as interesting as any of the noise musicians I've seen in the Kansai area were produced by this table of electronics.Quirky, interesting, layered, noisy. I liked this quite a bit. 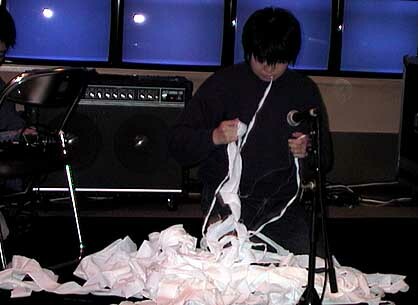 MAKABE uses some inexpensive toy keyboard to producemelodic notes, along with the amplified sounds of cloth ripping provided by UEMURA. 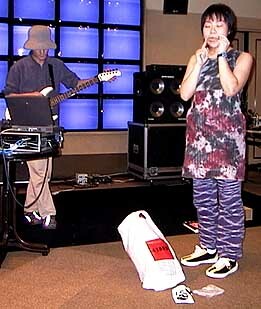 Another performance I really enjoyed by 1/fish. 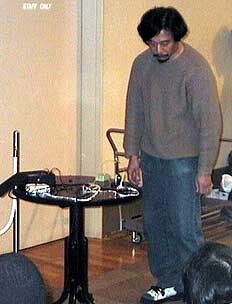 Akie played his electric guitar by banging on it in areas where there weren't strings, and his computer generated random sounds including piano and other things. 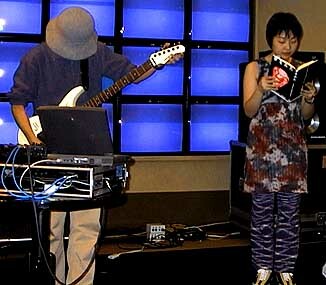 KOBORI Natsuyo read a book aloud, played a "jew's harp", worked a music box, banged on a wooden box with drumsticks, but all of her efforts were completely inaudible, the guitar and computer generated sounds overpowered everything. It was an interesting reversal of expectations for me. 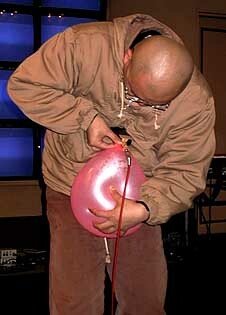 Balloon's squeals were amplified as every bit of air was heratlessly forced out of it by IWABUCHI Takuro. 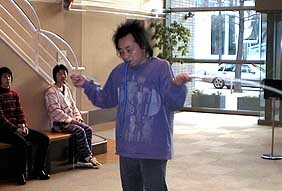 HIRAI Masaru. Corrugated plastic tubes, blown through, and spun in each hand, for a brief amount of time. A whole variety of sounds like you might hear from an un-tuned shortwave radio came from this tinfoil covered contraption. 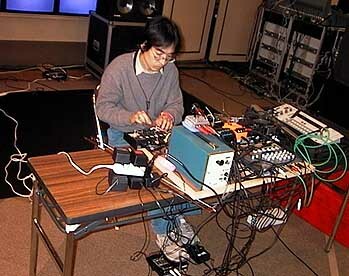 SAKAIDE Tatsunori only occasionally touched, to move an aligator clip a little.